The 6ft x 8ft Tongue and Groove Reverse Apex Shed is part of our high quality Select Tongue and Groove range. 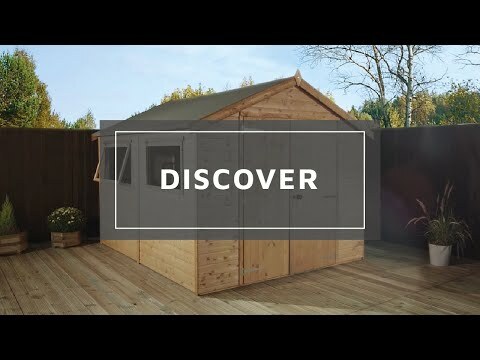 These wooden sheds are designed to cater for all kinds of garden storage needs. This garden shed is clad with 12mm tongue and grooved timber panels which make them very attractive and durable. The roof and floor are constructed from solid sheet materials to provide maximum stability. We've listened to our customers and placed the garden shed's single door on the 8' panel instead on the smaller 6' side. The door comes with a pad bolt as an added security measure. These wooden sheds' doors have 10" black antique hinges which stand out and looks very attractive. We have incorporated one opening styrene glazed window on the front side which gives these sheds a unique appearance. This feature allows plenty of sunlight to flow into the shed and keep it illuminated throughout the day. You can store taller items because of the buildings' apex roof which comes with hard wearing mineral roofing felt to ensure that the timber underneath stays protected from wood rot or fungal decay. Thank you for leaving feedback and I hope that you have many happy years using the product. Thank you for taking the time to review our product. I have looked into your order and can see that you have reported this to us. I believe we have offered to replace the panels in question and the offer is still available. Review:Well constructed and easy to assemble with simple instructions. I am glad that you are happy with the quality of your tongue and groove shed and I thank you again for having taken the time to offer your much appreciated feedback. Review:I built it over two days. Needed a helping hand when attaching walls and roof. Everything else can be done on your own. An electric drill screwdriver is a must. It is good to know that assembly was fairly straightforward and that you are happy with the quality of your tongue and groove shed. Thank you again for your much appreciated feedback! Review:Great shed for the price, feels very sturdy and great quality. It took about 3 hours to build and the instructions were clear and easy to follow. It is great that you are happy with the quality and value for money of your tongue and groove shed and that the clear instructions led to a straight forward assembly. Thank you again for your great review! It is wonderful that you are pleased with the quality of your tongue and groove shed as well as with all aspects of the service we have provided. Thank you again for your positive feedback! I am glad that you are happy with both the service and quality of your tongue and groove shed and I thank you again for your positive feedback. Review:Great item, well built shed that looks great too. Delivery was on time and delivered by a lovely, helpful chap. It is wonderful to know that you are very pleased with the quality and appearance of your tongue and groove shed and that you found or delivery driver to be lovely and helpful. Thank you again for your review. Review:There was an over emphasis on the communication between yourselves and me as the customer which was confusing. I had emails, then postal information (for which I already confirmed via email) and then there was telephone communication. I am sure this could be streamlined or improved. Please accept my apologies for any confusion caused regarding communication. We take all of your comments on board as we are always looking for ways to improve on the services provided. Thank you again for your feedback! Review:Shed could have been of sturdier construction. Rafters too light. Floor and roof material flimsy. Couldn't expect more for the price. Went together well with clear instructions. Very pleased and looks good. I am pleased to know you are happy with your tongue and groove shed and that you feel it is good value for the price. thank you again for your feedback! Our Reply:Please accept my apologies for the fact that the instructions were not as easy to follow as hoped for. Should you have any queries or have not managed to resolve the issue with the broken part, please contact us on 01636 880514 and we will gladly assist in getting resolved for you.